Like most Catholic moms, I'm slowly collecting Tomie DePaola books for the kids. 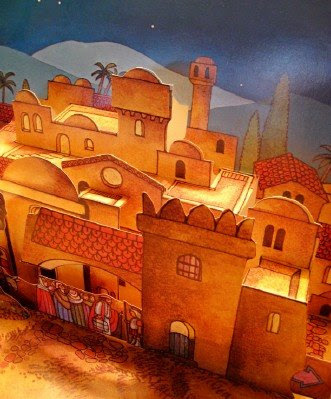 The First Christmas triptych has fast become our favorite book of the season. You might not find a $1 Goodwill copy like I did, but anyone can print a DePaola nativity to enjoy at home. What's the most-read Christmas book in your home this year? Big Girl and I started reading "Little House in the Big Woods" and I'm hoping to finish the Christmas chapter tonight. I'm hoping to give her a sense of how wonderful a humble Christmas morning with family can be. We love "The Crippled Lamb" by Max Lucado. Joshua the sheep keeping the Baby Jesus warm on the night He was born. Our girls' elementary school actually does a unit in first grade on Tomie DePaola, so our girls just love his work! I'll have to check back in a few days to see the results! My girls are 19 months and we have a few Christmas board books but none of them grab me deep down with the simple truth and love of Christmas. The girls' Gi-Gi gifted them a Little People Nativity so we have been re-enacting the Christmas story :). I second your choice! I picked this up new several years ago for just a few dollars at a deep-discount closeout bookstore. We love it! Although they are not Christmas books, my baby Bre and I are hooked on the "Shoe Books". We started with Ballet Shoes, and next plan to read Skating Shoes. These, of course, are abundant at second hand sources. It used to be Jonathan Toomey, but my son is too cool now [i.e. 14]!! My daughter has read and re-read "Christmas with Little Womenn," and I love both the "Crippled Lamb" and "How Santa Got his Job." I've posted on these at my blog, too. I'm curious, what does being Catholic have to do with collecting DePaola books? I've never heard that. Eek! I just pulled our copy from the Christmas book stack and put it where the little kids can't help themselves. I don't know about the kids but my favorite is "The Miracle of Jonathon Toomey"
I totally didn't know you were Catholic, btw - wow, that's a happy surprise for me. I haven't done much reading at all due to flu, but we have read "This is the star" a few times - it's short, beautifully illustrated and with poetic and thought-provoking words. I love "Christmas Day in the Morning," by Pearl Buck, in a picture book edition illustrated by Mark Buehner. My 7-year-old isn't a big fan, but it makes me cry every. single. time. We also love "Christmas" by Peter Speirs and "Christmas in the Country" by Cynthia Rylant. of course, that's only a SMALL sliver of his body of work! i love tomie depaola, but more for his italian roots than his religious ones. i have fond depaola holiday book memories, but in our house, our 4 year old's favorite book this year is called "cookie angel." Ours is "The Night Before Christmas"; the rolling poetry appeals to my 4 1/2 yo book lover and 17 mo book eater. Thanks for the explanation on the books on saints; my MIL devoutly loves the saints but I'm not comfortable with the somewhat gory saint cards that she wants to show my kids so perhaps these would be good for us. MERRY CHRISTMAS MEREDITH & FAMILY! "Gift of a Traveler" by Wendy Matthews. This is an awesome story with absolutely beautiful pictures. Check it out! Two of our favorites this year are "An Alcott Family Christmas" and "The Christmas Barn." Our favorite DePaola book is not a Christmas one, it's "Benedict and Scholastica." My daughter Helena loves that story and put Benedict's black raven and Scholastica's white dove on her First Communion banner. "Legend of the Poinsettia" is another good one. The most read book in our home when the children were small was of course the childs version of the Christmas story. Next was Twas the Night Before Christmas, read to put them to sleep after Midnight Mass. May you have a wonderful Christmas with your family. Wishing you all the best. We read The Best Christmas Pageant Ever by Barbara Robinson every year. I got a used copy on Amazon. It.is.hilarious!!!!! The kids love this story of a straggly bunch of kids who have never heard the Christmas story and how they end up starring in the church Christmas pageant. It's a real winner. We love Tomie de Paola too and are slowly collecting his books. Thanks for the link! the lyrics to "O Holy Night"
p.s. Meredith, I think Tomie d.P lives here in New Hampshire!